Looking for a recipe for mouth-watering barbecue ribs? Try our Spicy Mongolian Ribs recipe. Pre-cook the ribs on the barbecue, then finish with our Asian sesame dressing for ribs that come clean off the bone after grilling. Heat barbecue for indirect grilling: Light one side of barbecue, leaving other side unlit. Close lid; heat barbecue to 350ºF. Place ribs on grate over unlit area; cover. Grill 2 hours or until tender, turning every 30 min. and monitoring for consistent grill temperature. Meanwhile, mix remaining ingredients until blended. Move ribs to grate over lit area of barbecue; brush with half the barbecue sauce mixture. Grill 15 min., turning and brushing occasionally with remaining barbecue sauce mixture. 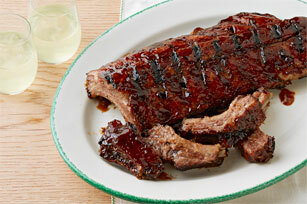 Cut ribs into 3- or 4-rib sections; place, on sides, in slow cooker. Cook on LOW 6 to 8 hours. (Or, place cut-up ribs in Dutch oven or stockpot. Add enough cold water to completely cover ribs; cover with lid. Bring to boil; simmer on medium-low heat 20 min. ; drain.) Heat barbecue for direct grilling to medium heat. Add half the barbecue sauce mixture to ribs; toss to evenly coat. Grill 15 min., turning and brushing occasionally with remaining barbecue sauce mixture. Serve these tasty ribs with baked potatoes and a crisp mixed green salad tossed with your favourite Kraft Dressing.